1. 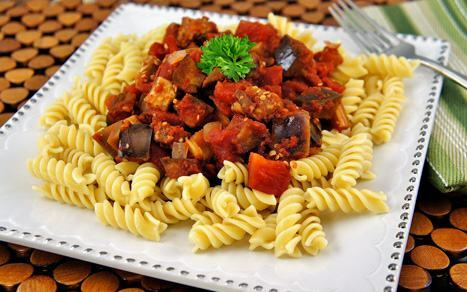 Combine tomatoes, tomato paste, wine, eggplant, onion, garlic, oregano, and ½ teaspoon salt in a 5-quart slow cooker; cover and cook on low 4 hours or until eggplant is soft and sauce is thick. 2. Just before sauce is done, bring a large pot of salted water to boil over high heat. Add pasta, and cook until al dente, about 10 minutes. Drain pasta, and toss with sauce. Garnish, if desired.